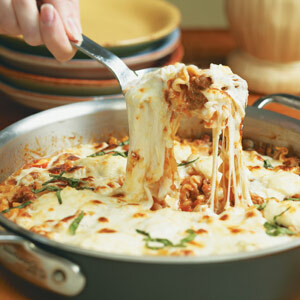 If you love the taste of lasagna but don’t have time for the labor-intensive layered version, this cheesy skillet recipe is the way to go. Brown sausage in oil in a sauté pan over high heat, 5 minutes, crumbling with a spoon to break up large chunks. Stir in onions and garlic; sauté 2 minutes. Add tomatoes, mafalda, broth, Italian seasoning, and pepper flakes; season with salt and black pepper. Bring mixture to a boil, reduce heat to medium-low, cover, and simmer, stirring occasionally, until noodles are soft, about 10 minutes. Preheat broiler to high with the rack 5–6 inches from element. Off heat, stir in cubed mozzarella and ¼ cup Parmesan. Dollop with ricotta, top with mozzarella slices, and sprinkle with remaining ¼ cup Parmesan. Broil lasagna until cheeses melt and brown slightly, 4–6 minutes. Garnish lasagna with basil. Serve with Herbed Garlic Bread. Add the tomatoes, pasta, and broth, stirring well to evenly distribute the noodles. For the finishing touch before broiling, top the lasagna with ricotta and fresh mozzarella. This crisp-chewy garlic bread, with butter and olive oil, plus fresh chives, is a great go-along with any pasta dish.